AUSTIN – At the urging of the 82nd Texas Legislature, the Texas Department of Public Safety (DPS) has developed a secure online prescription monitoring program, called Prescription Access in Texas (PAT), which provides controlled substance prescription dispensing history to authorized health care and law enforcement professionals. DPS officially launched PAT in June 2012, at which time the database became available to a select group of practitioners, pharmacists and law enforcement professionals. This week, DPS has extended program access to additional physicians and law enforcement, mid-level practitioners, medical board and nursing board investigators. DPS launched a pilot version of the PAT in August 2011, which has since proven successful. Each registered user must provide licensing information to ensure data is released only to authorized users. As required by statute, the PAT database includes Schedule II – Schedule V drugs for the last 12 months only, and pharmacists must report prescription data within seven days of the prescription being filled. In 1982 the Texas Legislature created the original prescription drug monitoring program, which is now called the Texas Prescription Program, as an efficient, cost effective tool for investigating and preventing drug diversion. Since then authorized users have had to access to this information through a manual paper process. PAT, the new online version of the database, represents a substantial upgrade by allowing instant, 24/7 access to authorize users. In addition to this week’s expansion of access to PAT, additional users will continue to be phased in over the next two months. Pharmacists and pharmacy board investigators are on track to acquire access to the system in mid-August, and podiatrists, dentists, veterinarians; board investigators for each of those three professions; and out-of-state practitioners are scheduled to obtain access near the end of August. Texas law restricts access to prescription data to practitioners and pharmacists who are inquiring about their patients, and to various regulatory and law enforcement personnel conducting investigations. Practitioners include physicians, dentists, veterinarians, podiatrists, advanced practice nurses or physicians assistants. In March of 2010, President Obama signed into law two separate Federal Acts, which included modifications for Medicare and Medicaid. The Acts are titled the Patient Protection and Affordability Care Act of 2010 (PPACA) and the Health Care and Education Reconciliation Act of 2010 (HCERA). As it pertains to future Medicare coverage, one of these Federal Acts sought to update coverage guidelines for certain classes of drugs which have been traditionally excluded from coverage. Starting on January 1, 2013, Medicare Part D will cover benzodiazepines and will cover barbiturates used in the treatment of epilepsy, cancer, or a chronic mental disorder. Starting in 2014, Medicaid programs will no longer be able to exclude smoking cessation agents, barbiturates, and benzodiazepines from coverage under Medicaid. Because Part D covered drugs are defined generally as those drugs that are covered under Medicaid, this new provision will result in a small expansion of Part D coverage of barbiturates. Today was The Great American Smokeout. A day that builds awareness about the benefits of quitting smoking. Since 2000 smoking bans have been spreading nation wide and they seem to be working. Do you think smoking bans in bars, restaurants, parks, and work places really help? The FDA announced that it will recommend that hydrocodone-containing products not be moved from Schedule III to Schedule II. DEA believes that rescheduling would reduce abuse of the drug. In recommending against rescheduling, the FDA said that more emergency room visits occur with oxycodone products than with hydrocodone. The FDA also expressed concern that movement of hydrocodone-containing products to Schedule II could lead to the use of more NSAID products as well as Schedule II opioid products. NCPA will be providing testimony opposing the rescheduling of hydrocodone containing products when the FDA holds a public hearing regarding this topic in the future. 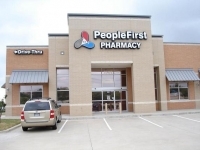 PeopleFirst Pharmacy now has an adherence program. This program is designed for you to take your medications exactly the way they were meant to be taken. We package these medication in easy to use packets. Each packet contains medications based on the time that you are supposed to take them. Since each packet has the date and time on it, you will never get off track on how you are supposed to take your medications. Another amazing thing is all of your medications will get synchronized. This will reduce the number of trips to just one a month. It will also allow us to have your medications ready right before you need them again. As you already know, we can hand deliver to your doorstep. Call Dr. Prarke Patel or Demitri Ballard at 972 300 4130 x462 for more information. We just received lots of Circle E candles for the holidays. We hear that they are hard to find and we are about the only ones carrying them in this area. Love the way they smell. Additionally, we have also set up Christmas gift items in the front area. Because we cost the same as or less than the huge, impersonal stores. Your copay is the same with us even though we are an independent pharmacy. We offer far better service and prescriptions are usually ready in 10 minutes or less. We also offer compounding and delivery to your home. Our staff knows most customers by name and their individual preferences. Same copays. Better service. Why go anywhere else?